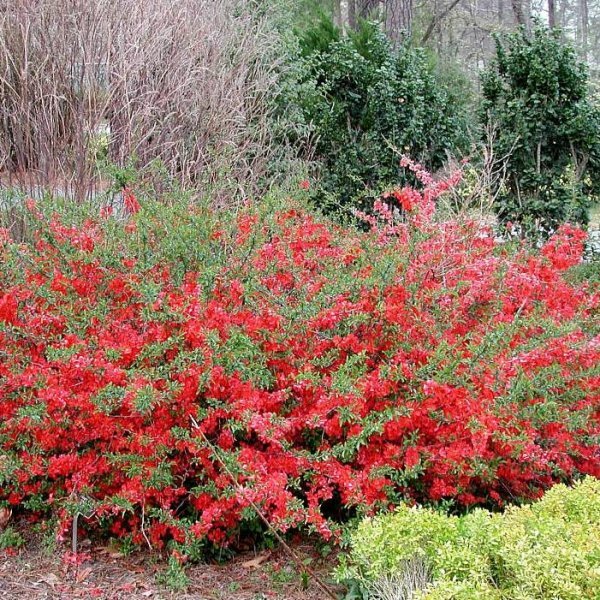 When in bloom this Chinese shrub is a beauty, but through the rest of the season it has a coarse, rambling, ungainly look. 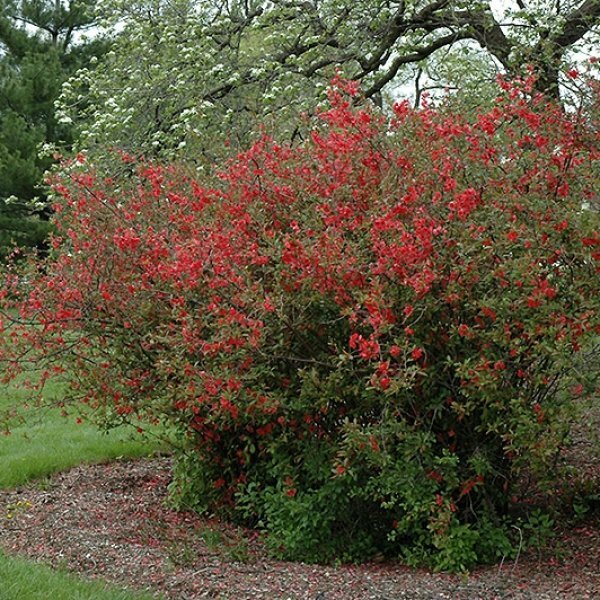 Flowering quince is a spiny, medium-sized, deciduous shrub most noted for its clusters of bright red, bowl-shaped flowers that cover the plant in early spring, both before and after the foliage emerges. These are followed by small quince fruits that are edible and best eaten cooked into preserves or jelly. The glossy, oval leaves of this hardy shrub are deep green and have small teeth along the edges. The branches are armed with long thorns that are strong and can cause painful scratches. Pretty rosaceous blooms of red are produced in spring, and fragrant, yellow-green, apple-shaped fruits ripen in the fall but offer no visual appeal. Germination -	Moisten 1/2 cup or about 1 handful of peat moss. Place the peat moss into a sealable container or a zipper top plastic bag. 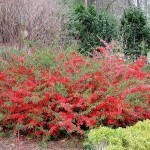 -	Place the flowering quince seeds into the bag or container of peat moss, then set in a cold location. The back of your refrigerator with the temperature set between 35 and 40 degrees Fahrenheit is ideal. -	Remove the bag or container from the refrigerator 90 days later and plant the seeds. -	Fill up 1-gallon plastic planting pots with a good quality potting mix to about an inch from the rim. -	Poke two holes, each 3/8 inch deep and spaced 2 inches apart, in each of the gallon pots. 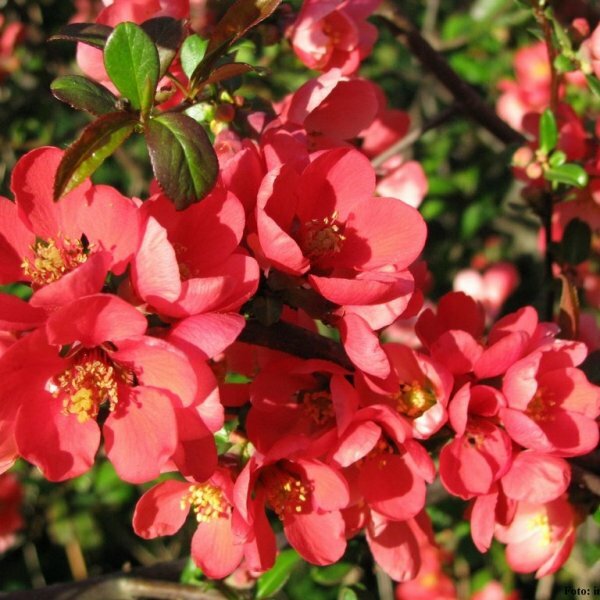 Plant one flowering quince seed into each of the holes. Scatter approximately 3/8 inch of potting soil over the seeds. -	Set the pots in a sheltered location away from direct sunlight. 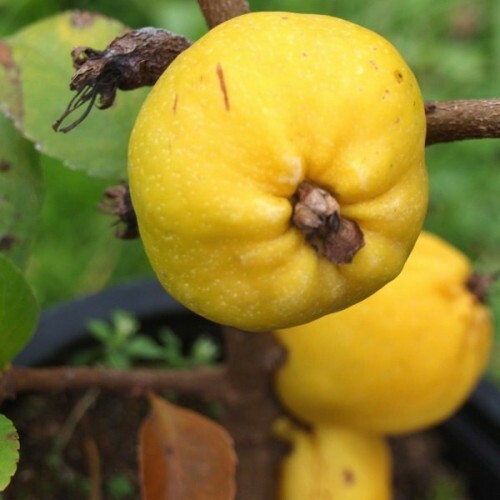 Keep the flowering quince seeds moist so the soil is wet but not soggy. Germination can be lengthy, often taking four to six weeks. -	Transplant the flowering quince into permanent locations the following spring. Be sure to provide the seedlings protection over winter; bring them indoors or set them in a temperate location.